Deep crimson single flowers, with attractive golden stamens. 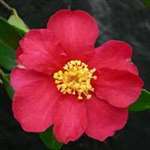 The flower is very similar to that of 'Yuletide', but tends to be a little larger and a little more of a pinkish-red. The growth is vigorous, upright and very open, particularly as a young plant. Flowers October to November. Prefers a sunny, sheltered position. Deep crimson single flower, with attractive golden stamens. Upright, open growth. Flowers October to November. Packing and Delivery arrangements were very good indeed. The plant delivered was a very good quality plant and arrived in excellent condition. However, I expected a red flower (crimson?) and it is in fact dark pink - perhaps you should warn people. Plant already in flower and looking good. An easy to navigate website with useful advice for novice gardeners (like me!). Purchasing was very straight forward and the plant arrived swiftly, carefully packaged and in very good health. Whether it will remain so after I've got my hands on it is another matter, but I'd have no hesitation in recommending Trehane.